Why Tilt-A-Way Vertical Pivot Gates? SecurityWorks, Inc. can assist you in specifying, providing, and installing the "Patriot" system. Please feel free to contact our staff who will gladly help you with your selection of the correct equipment for the job. The barrier is made of steel or aluminum for long life. We offer an anti-twist and sway design. This vertical pivot gate is high in security but yet keeps its modest look. Tilt-A-Way vertical pivot gates are balanced by two springs that pull in a straight line for maximum life. The springs are protected by our patented design. A center pull enhances the spring’s life cycle. The barrier is automatically locked when in the down position. All hinges are stainless steel. A safety control is provided to protect the gate’s balance system. The main power switch is located in a secure control box. All solenoids are constant duty. The connection arm controlling the barrier is secured in a rubber shock absorber for smooth operation, and provides extended life for the operator and barrier. The limiting switches mounted at each end of travel ensure an accurate, and positive control. 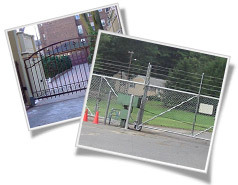 Complete installation instructions, accompanied by an illustrated parts list and operations manual, are included with each vertical pivot gate.